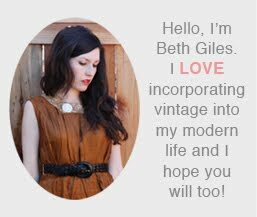 Vintage Clothing Blog | Vintage Wedding Dresses | Salvage Life: My ego is prego! Well, I have a special announcement that I thought all my readers may be interested in. I am pregnant! My husband and I are expecting our first child on January 19, 2009. We are so thrilled! I am 17 weeks and have an ultrasound scheduled for 2 weeks from tomorrow in which we should be able to find out the gender of the baby. I am currently feeling well, but my planning is on hold until I know if I should be buying blue or pink (not that I am really into pastels, but you know what I mean). For my devout customers, don't worry Salvage Life isn't going anywhere! Luckily, I work from home where the baby will be, so I will continue to run the business once the baby is born. However, I may need a week or two off. Hey, maybe I'll even add a vintage baby category! You should expect to see some baby posts in the future as attempt to find things to wear that accommodate my ever-expanding belly, decorate the baby's room and plan for his or her arrival. Please send me any links to good baby product sites, especially those that have eco-friendly or vintage products. Hi Beth it Rebekah from Earth Babyee www.earthbabyee.etsy.com. Congratulations on the new addition to your family. I hope you have time to checkout my site. Me and my sister make organic and upcyled toys and clothing for babies!! CONGRATULATIONS!!! SO excited for you guys!